House and time at Malvern: Sch, 1909 - 1911. Died: 09 April 1917 aged 22 in France. Killed in action at Arras. Son of William and Katharine Hill, of "Sunnycroft", Tamworth, Staffs. b. 1895. Great War, Inns of Court O.T.C. 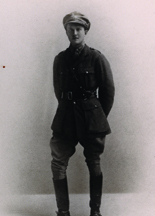 1915; 2nd Lieutenant. North Somerset Yeomanry attd. 1st Bn. Somerset Light Infantry.